Get your hands on some beautiful interactive elements of making with our professional designer makers. Saturday 15 September – 10:30 – 1:00 in the Education Tent, Walled Garden. You will be making a complete mosaic piece to take home and display. Using a pre-cut heart shape made by Susie and pre-cut mosaic. She will demonstrate how to cut the pieces, and how to mix the grout. 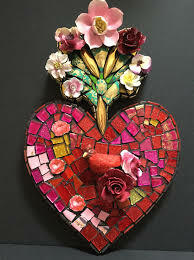 You are encouraged to integrate something personal into the mosaic by either bringing a special or broken plate, small found object or piece of jewellery of sentimental value. Susie Chaikin is an artist whose practice encompasses painting, mosaic and embroidery. She is showing her work on the Makers’ Emporium Stand. All the materials will be included in this workshop. You will make a decorative plaster tile to take home. You are encouraged to bring plant material from home or collect from Trereife Park. You will be given expert advice on the make -up of the plaster and the best way to get a crisp and details cast. Jessica says “I love capturing a unique and beautiful plant moment in plaster and preserving it forever. With each tile I try and capture some of the ephemeral qualities of plants. 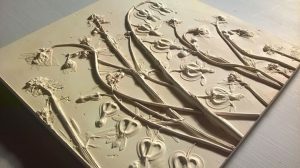 I create botanical plaster reliefs and each impression can be cast only once, so truly unique, art pieces, clocks & mirrors”. Get involved with the elemental experience of how clay is transformed by heat. Decorate a specially made pot by Sally Tully using her specially-made metallic glazes. Watch them be fired in an open gas-fired kiln, put into sawdust and then plunged into water. You will then clean up the pot and discover its amazing iridescent surfaces. You will be thrilled and surprised. Take your pot home with you! Sally’s unique creations are truly a thing of beauty, and the processes behind each one are fascinating. 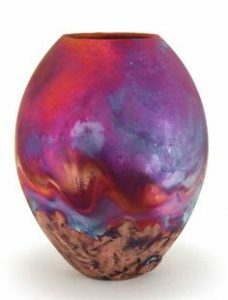 There are many different techniques that Sally uses; Raku and smoke firing being the two principal ones. Raku pots are glazed and when ready put into sawdust for post firing reduction. These are brightly coloured and have a glossy glazed finish. She also does Smoke firings where the burnished bisque fired pots are wrapped tightly in organic materials such as seaweed collected locally. These are then fired in a sagar in her Raku kiln where the natural minerals impart their colours into the surface of the pots. Each and every piece she makes is unique, the variables of these techniques allow the creation of individual pieces of art. Sue Dove with her long experience of keeping creative journals will help you to break through the fear and reluctance often associated with sketchbooks. 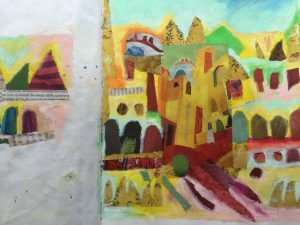 Using mixed media, monoprint, collage and drawing she will help you start books full of ideas, colour, pattern and personal narrative. She studied Textiles at Liverpool Polytechnic. In 1992-95 she spent time in Australia, painting, producing textile pieces and teaching in Mullumbimby. She ran the HND in Fine Art Textiles at Cornwall College. Sue’s processes are painting, collage and mixed media with stitch. Make a ‘Springtime’ platter so called because they are made with the vibrant colours of Spring cut willow with coloured bark and some white and buff willows. 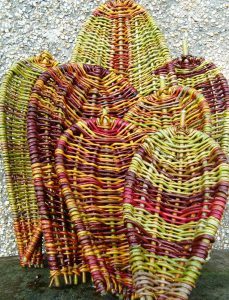 Geraldine will demonstrate the different varieties of basket-making willow. The later autumn-cut colours are beautiful but not so vibrant. The design is taken from the Irish ‘sciathog’, often used to strain and serve potatoes to the table. Geraldine Jones is a co- founder of ‘Basketry and Beyond’ an organisation that works to preserve what has been learnt from traditional basket-making, to explore new ways of making and to expand the boundaries of the craft. She is often commissioned to create structures for special events. She is a member of the Cornwall Craft Association and has a workshop at the Salt Cellar studio in Porthleven. 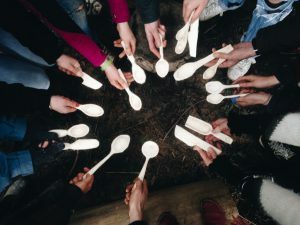 It is relaxing to carve a spoon or spatula; you sit in a companionable group making something useable of your own from the branch of a tree using traditional woodcarving tools. Felix is willing to share his knowledge and understanding. Each step of the process will be demonstrated, from the selection and cleaving of greenwood using a hand axe, to shaping using chip knives and gouges to final finishing. 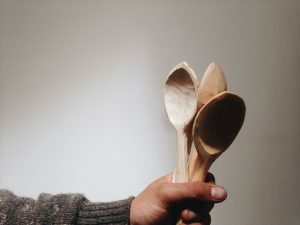 Felix Kary is a spoon carver, craft teacher and skilled woodsman based in South Devon. He works as an artist and as an educator to place value on traditional craft. 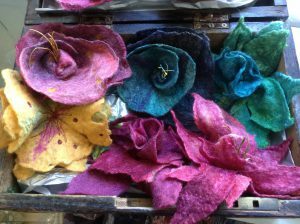 This short course will give an introduction to the exciting and ancient craft of feltmaking by combining wool fleece with soap and water, and then using gentle manipulation, this magical process will be explained. You will be able to create a beautiful delicate felt flower which may be worn as a corsage or a hair adornment. Lizzie Houghton trained as a fashion designer and is now a renowned feltmaker, specialising in wearable art. A love of colour, pattern, textures, and natural forms combined with luxury natural fabrics are Lizzie’s greatest inspiration. She makes jackets, dresses, hats, scarves and accessories often incorporating her hand-dyed silk fibres and fleece. Her felt is of a fine drape-able quality and sumptuous colours. She is author of ‘Creative Feltmaking’, and the acclaimed book ‘Felting Fashion’, which has just been re-published in paperback. Lizzie has taught her skills throughout the UK, Europe, America, Australia and New Zealand. Her beautiful work is in collections all over the world. 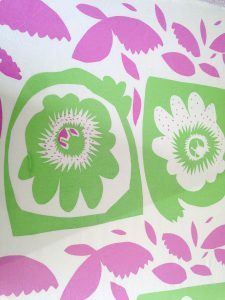 Design and make a stencil printed bag. Print your design with fabric inks and make a lovely colourful bag to take home. Kathryn Clarke is a freelance designer with design, making, pattern cutting and print skills, producing her own accessory collections. She has worked for many years as a bespoke dress designer for a couture company and has great experience in designing and producing costumes for theatrical companies. She is showing her accessories alongside Liz Lippiatt. What on Earth is Clay? Drop in for a talk with inspiring makers whom are specialists in their field. Talks will take place in the 'Talk Box' located in the Design Lounge entrance tent. FREE - all are welcome. ANNA POPE is currently working on a project investigating fish traps and lobster pots! She was inspired when she met Richard Ede, a Cornishman and one of the last remaining lobster pot makers. She will be talking about her project and showing some of the research she has been doing on West Country makers, with the aim to interpret her findings into a collection of contemporary fine jewellery/sculpture which she will show alongside pieces by the featured makers in the exhibition. ‘Every Basket tells a Story’… will be shown at Devon Guild of Craftsmen, Bovey Tracey, Sept 6 – Oct 13 2019. Anna Pope graduated from Loughborough University in 2012 with a first class honours degree in 3D Design: New Practice, where she spent three years experimenting with a mix of mediums, such as wood, ceramics and metal. She discovered a joy in exploring the boundaries of the materials and techniques. She uses and mixes basketry skills with jewellery techniques, using them to trap stones within a woven form and making forms that resemble a traditional bezel. Clayground Collective – What on Earth is Clay? The co-director of Clayground Collective, will talk about clay the material and what it can do, as highlighted in Clayground’s recently published book Clay in Common. Clayground Collective work primarily in the public realm. They commission, facilitate, educate, write and create projects which involve the wider public. DUNCAN HOOSON is Stage 1 Leader on the BA Ceramic Design course at Central Saint Martins, London and Head of the Ceramics Department at Morley Adult Education College, London. Duncan is a ceramic artist and educator specialising in participatory public artworks and collaboration with artists in different fields. His ceramic and art commissions include permanent installations outside the award-winning Alsop/Stormer Library in Peckham, South London, at BBC Leicester and at Hove Museum. He has designed and made large-scale temporary work for Sadler’s Wells and South Bank Centre, London. Duncan is Head of Ceramics at Morley College and Stage 1 Leader BA Hons Ceramic Design at Central Saint Martins. He has extensive experience of working with students of a range of ages and abilities in formal and informal education. He is Co-Author of The Studio Guide to Ceramics(Thames and Hudson 2012). Breeze Fair has a number of talented artists ready to participate in a 'show and tell' demonstration. Please join us either on the HaHa Green at the front of Trereife House or under the thatched bandstand to the side of the main tent. Times of events will be posted on the day and in your fair guide book. Amongst the demonstrations being given visitors will discover: basket weaving, lobster pot making, raku firing, pottery wheel throwing, blacksmithing, jewellery making, spoon carving and wood turning.